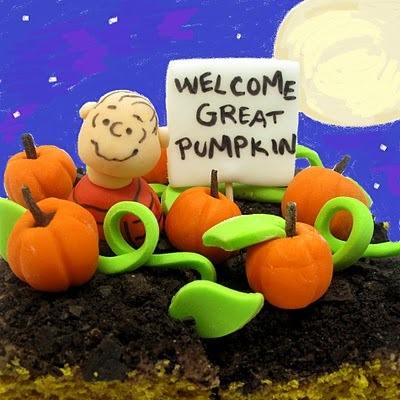 If I get out our DVD of It's the Great Pumpkin, Charlie Brown and make Miss Ruby watch it over and over and over again, I wonder if she will fall in love with it so that I can make this Great Pumpkin Cake for her birthday. Linus is too cute to resist and with Meaghan's great tutorial and my favorite marshmallow fondant recipe the fondant pumpkins would be easy peasy. You can check out this cute pumpkin patch cake over on The Decorated Cookie.